It might as well be its own holiday. 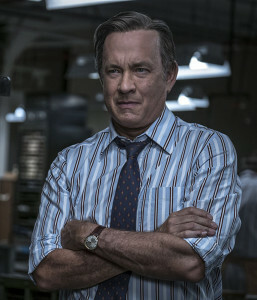 First, Tom Hanks stars in “The Post” (HBO, 8 p.m.), making its premium cable debut, in which he gave his Oscar-nominated performance as Washington Post editor Ben Bradlee, alongside the similarly nominated Meryl Streep and a packed cast that includes Sarah Paulson, Bob Odenkirk, Tracy Letts, Bradley Whitford and Matthew Rhys. 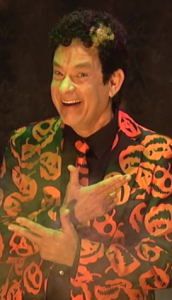 Then, most likely, you’ll see Hanks relive his role as David S. Pumpkins in a compendium among the Halloween sketches that will serve as tonight’s “Saturday Night Live” (NBC, 11:30 p.m.). Yes, it’s five days until Halloween, but Hallmark jumps two holiday seasons by starting its own Yuletide onslaught with “Christmas at Pemberly Manor” (Hallmark, 8 p.m.), an attempt to turn Jane Austen into one of its romance yarns.This one stars Jessica Lowndes and Michael Rady and is set in the modern era (too expensive to do a period movie?). Unfortunately it is not an adaptation of the popular play by Lauren Gunderson and Margot Melcon with a similar name “Miss Bennet: Christmas at Pemberley.” (Actually it just seems like they’re using the names from Austen). More to the season is the made-for-TV horror film “Zombie at 17” (Lifetime, 8 p.m.), with Laura Fortier, Seamus Patterson and Celeste Desjardins. Other scary movies tonight include “Stephen King’s ’It’” (Paramount, 5:30 p.m.), “Leatherface” (Syfy, 7 p.m.), “Friday the 13th” (AMC, 7 p.m.), “Bram Stoker’s Dracula” (BBC America, 7:30 p.m.) and “Friday the 13th Part II” (AMC, 9 p.m.). There’s more ghosts on Turner Classic Movies tonight with “The Ghost and Mrs. Muir” (8 p.m.) and “The Ghost and Mr. Chicken” (10 p.m.). Then comes the crime noir, “Follow Me Quietly” (midnight), followed by the double feature of “House of Dark Shadows” (1:30 a.m.) and “Night of Dark Shadows” (3:30 a.m.). College football on primetime TV tonight has Navy vs. Notre Dame (CBS, 8 p.m.) and Texas at Oklahoma State (ABC, 8 p.m.). They follow a large slate listed below. Game 4 of the World Series has Red Sox at Dodgers (Fox, 8 p.m.). Brandi Carlile plays a new “Austin City Limits” (PBS, 11 p.m., check local listings). An all-female crew in a boat deal with an invader on “Dead in the Water” (Syfy, 9 p.m.). “My Big Fat American Gypsy Wedding” (TLC, 10 p.m.) is back with a couple of episodes. Five men choose from 12 remaining women for dates on “Ready to Love” (OWN, 10 p.m.). College football begins at noon with games that include Clemson at Florida State (ABC), Wisconsin at Northwestern (Fox), Purdue at Michigan State (ESPN), Texas Tech at Iowa State (ESPN2), Massachusetts at Connecticut (ESPNU) and Army at Eastern Michigan (CBS Sports). After TCU at Kansas (Fox Sports 1, 3 p.m.), games at 3:30 p.m. include South Florida at Houston (ABC), Arizona State at Southern Cal (ESPN2), Kansas State at Oklahoma (Fox), Florida vs. Georgia (CBS), Iowa at Penn State (ESPN), Northern Illinois at BYU (ESPNU) and Cincinnati at SMU (CBS Sports). Then comes Washington at California (Fox Sports 1, 6:30 p.m.), Texas A&M at Mississippi State (ESPN, 7 p.m.), North Carolina State at Syracuse (ESPN2, 7 p.m.), Tulane at Tulsa (ESPNU, 7 p.m.), Boise State at Air Force (CBS Sports, 7 p.m.), Oregon at Arizona (ESPN, 10:30 p.m.), Hawaii at Fresno State (ESPN2, 10:30 p.m.) and San Diego State at Nevada (ESPNU, 10:30 p.m.). Hockey includes Montreal at Boston (NHL, 7 p.m.). Auto racing includes the Texas Roadhouse 200 (Fox Sports 1, 1 p.m.).